This Heroic Tier adventure module can be used in any D&D 4e Campaign Setting. The battle is over, and the terrible gates to the Oblivion have been closed and sealed. 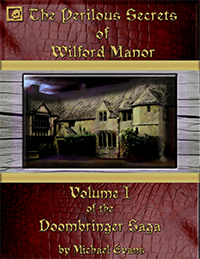 The Bear & Ale Inn is in shambles, but the Heroes survived the evil Curse, and destroyed the horrible things from beyond. Tragically, some have perished, but the survivors are thankful and proclaim them as Saviors! But is it truly over? Could there be another Cursed Scroll being enchanted even now? Where will the next scroll be delivered, its evil runes scribing a message of death and madness? 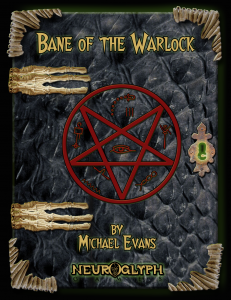 Bane of the Warlock is a D&D 4E Adventure for five Characters of Levels 2 to 3, and is the sequel to the free encounter module, A Curse at the Old Inn. A unique puzzle based upon a famous cipher, guaranteed to challenge your Players. A mini-monster manual of 9 new aberrant creatures. Player handouts, a new terrain hazard, new traps, and much more!